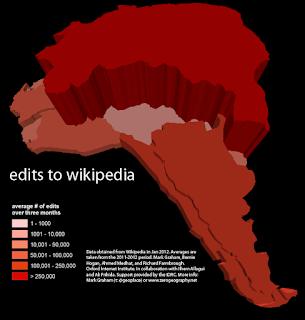 If you’ve ever wondered where edits to Wikipedia come from in South America, the map below might be useful to you. The answer is that almost half of all edits to Wikipedia from South America come from Brazil. These data are actually not that surprising considering that there are almost 80 million Internet users in the country (and Brazil is home to about 45% of all of South America’s connected population). Chile is the country that scores a lot better than would be expected. The country is home to only about 5-6% of the continent’s Internet population, but contributes over 12% of Wikipedia edits. I’ve finally merged the Wikipedia data with Internet penetration data, so will be creating maps normalised by each country’s connected population as soon as I get a few more free hours.